Tuesday Crustie: Yeti crab crushes Kremlin! Cig had never seen a yeti crab before, and decided to make something decidedly more simian than crustacean, keeping in the giant monster tradition started by King Kong. 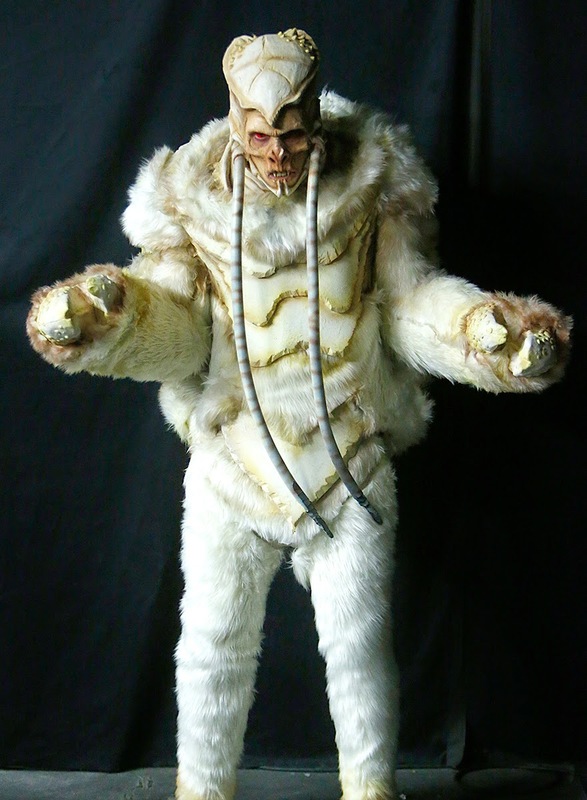 While I did enjoy Cig’s take on the yeti crab, I have to confess that I am pulling for Dina tonight! 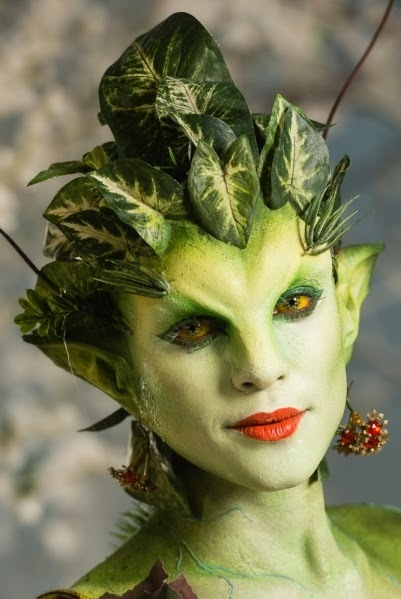 She captured my attention with this creation on episode 1 of this season. Should you reply to spamming students? A colleague, who is a new assistant professor, asked on Facebook, if he should reply to an “endless” stream of emails from international students. I know the kinds of letters this person is asking about. Many show the candidate has extremely limited ability to express him or herself in written English, the tone is often obsequious, and the letters are often clearly “form” letters sent to who knows how many institutions. What’s the right course of action? On the one hand, there is an actual person on the other end. A person who has probably gotten bad advice, but still. On the other hand, it can take up a huge block of time to reply to all of these. If someone sends you a cut and paste inquiry, it’s okay a cut and paste response. Signs of a cut and paste from a student include the opening, “Dear Sir / Madame,” or discussing research interests that are nowhere near the kind of stuff you do. Only if someone has clearly written a personalized inquiry to you, that shows they understand what you do, should you spend the time to write a personal response. I don’t have an endless stream of these letters - and I am the grad program coordinator - so I do reply. I send links to our entry requirements and program FAQ, and answer any direct questions in the letter. If you like fossils and yeti crabs, then this is definitely for you! It’s like he knows me! Nicolai’s new paper in Scripta Geologica erects a new family, Pristinaspinidae, to accomodate the fossil Pristinaspina gelasina, shown as a line drawing in the upper left corner here. 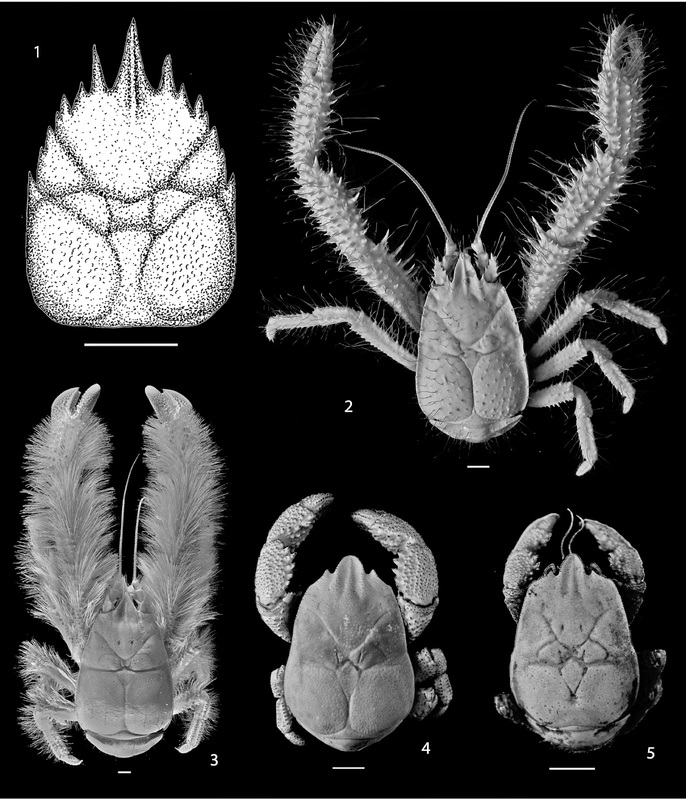 The other four pictures are its living relatives, yeti crabs, which remain in the family Kiwaidae. And yes, this is another excuse to remind you that I curate a dancing yet crabs playlist on YouTube. I am a romantic, I guess. I would like to see universities as places where everyone can thrive regardless of their background. A leveler, if you will, which provides an opportunity for people to improve their lot in life. My current university helped do that: UTPA has been credited with creating a middle class in South Texas. It shows that American universities are more often than not reinforcing existing class structures instead of minimizing them. It’s also important in thinking about in terms of our graduate programs, and the sort of people who make it through the bachelor’s to have the chance to earn a higher degree. Additional: It just so happens that the New York Times has an article about the “glass floor problem”, which is related to the article above. It emphasizes that the affluent have opportunities to hoard resources, preventing a leveling of the playing field. View the interactive version of this graph here. Hat tip to Joshua Hatch. The Zen of Presentations, part 66: What do you want your audience to feel? A common piece of advice for technical presentations is to figure out what your “take home message” is. People will only remember one or two things, to you should figure out what those will be. 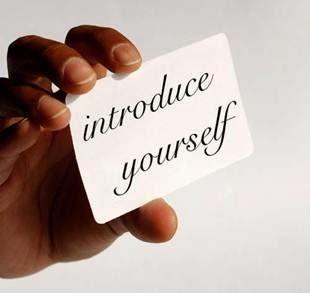 “The elevator pitch” is also about focusing down your information to a concise, under a minute format. This is good advice, but it is typical of academics: it focuses on the “head.” It’s a question about information. Lots of people who have thought about presentations have concluded that if all you are doing is relaying information, there is no point to having a presentation. If all you want to do is convey information, send an email. A presentation should be about more than that. Besides figuring out what you want your audience to remember about the information you presented, ask yourself what you want your audience to feel about what you presented. 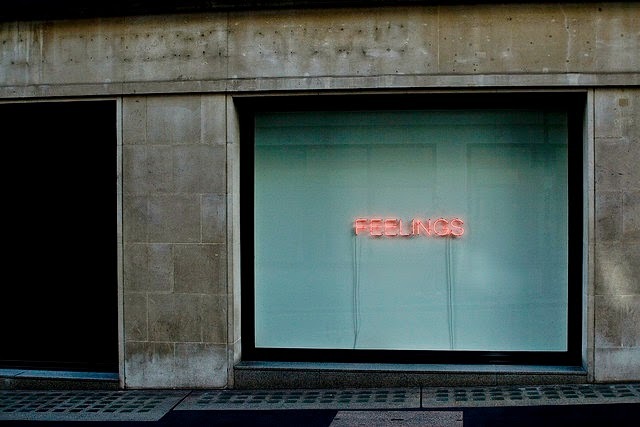 This does not mean that you can’t have multiple feelings in a talk. Something can be funny one minute and heart-rending the next. But like your take home message, you should think about the main emotion you want to convey. Once you’ve decided what you want them to feel, you can start taking steps to enhance that emotional core of your talk. For instance, do you have slides with dark, sober colours? Probably not what you want if you want people to leave feeling uplifted. This might not be a critically important consideration if you are giving a scientific talk to other scientists, who are also very “head centered.” But this could be very important when you are talking to people from outside your particular research field. Emotions are understandable to everyone, and are so much more contagious than concepts. (P)eople will forget what you said, people will forget what you did, but people will never forget how you made them feel. Photo by Nic Walker on Flickr; used under a Creative Commons license. People change their names for all sorts of reasons. Marriage is only one. What can you do to make sure people can find your scientific papers if you change your name? When you’re talking about your own CV or website, the task is trivial. All it takes is a note mentioning the name change. The problem is that many people look for papers through search engines: Google Scholar, Web of Science, PubMed, and so on. If they only know you by one name, they will not find papers you authored under the other name. This is not something that you, as the author, can solve, as far as I can tell. A stopgap is to create as many profiles about your research as you can, so that if someone finds your research on through your own website or similar, they are more likely to see the complete list of papers. It should not be your problem to solve. This should be a problem for the search engine services to solve. It seems that if there was widespread adoption of ORCID, there is a shot at making this a non-issue. Terry McGlynn looks at external reviews for tenure and promotion decisions. This has been a contentious addition to our procedures at UTPA recently. 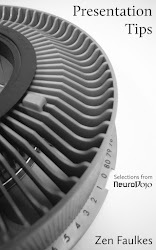 Neuwrite San Diego blog looks at science crowdfunding, and has a list of websites. 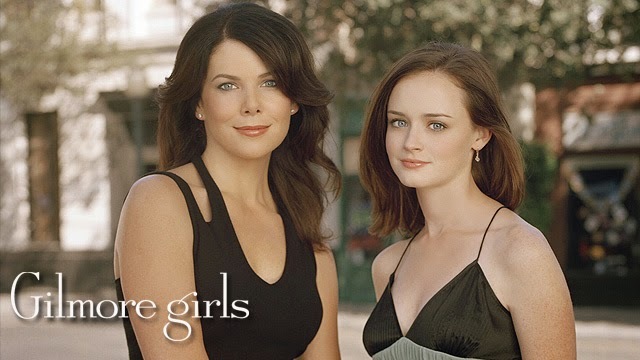 More than a decade after it debuted, Gilmore Girls is experiencing a renewed burst of interest after arriving on Netflix this month. When I saw Gilmore Girls, I was impressed by the speed and density of the dialogue. 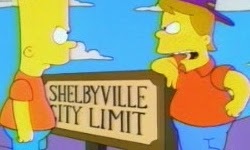 Joke, pop culture reference, joke, joke, pop culture reference... the writing kept coming at you, at a rapid clip. But it did so in a way that you never lost track of the plot. Even if you didn’t get any particular one-liner, you were able to follow the story. And there would be another clever bit in a minute or two. It just so happened Gilmore Girls started just before I took up the position I had, and I was teaching classes from stem to stern for the first time. When I started, students were always kvetching about slides going down before they could finish transcribing them. So I ended up going slow. Watching Gilmore Girls, I realized that people could handle a lot of information quickly. And that I could talk faster. I could put in more jokes, references, tangents... as long as I kept the main point that I was making front and center. If someone didn’t get one reference, I didn’t worry, I just kept on going. My lecturing strategy become to make a point quickly, but repeat it often, rather than make a point slowly and ponderously just the once. I don’t know if my lecturing style is better because of Gilmore Girls, but it certainly made it a lot more lively and fun for me. I just hope that my greater enthusiasm is contagious, and that students pick up on it. Hat tip to Gilmore Girls fan Ed Yong, whose tweets about the show prompted me to write this. Calm people solve problems. Panicked people cause them. (I)t is not inconceivable that new species could be found, but I laughed when I saw this picture. 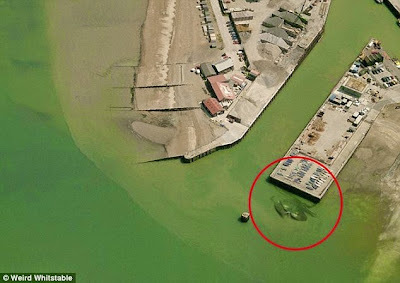 The news article is being kind to call this a “a well-doctored hoax.” A good hoax should have some plausibility to it. This one is ridiculous. Hat tip to Carin Bondar. Frankly, if we had not gone through our 10-year slide in research support, we probably would have had a vaccine in time for this that would’ve gone through clinical trials and would have been ready. We should not base arguments for science funding on specific promises for specific goodies, because a lot of things science promised never materialized. People will never stop asking where there jetpacks and flying cars are. More seriously, people ask why we still can’t cure cancer, more 40 years after President Nixon started what became known as the “war on cancer.” Unmet promises burns scientists. Perhaps a better argument (which I saw on Twitter, can’t recall who): We need the NIH to develop things like Ebola vaccines, because private industry probably has no profit motive to do so. Additional: Of course, I wrote all of the above before I saw that a Canadian-led Ebola vaccine is now in human trials. Maybe Collins’s statement was based on better knowledge than I had. But darn it, it still sounds like a fairly calculated ploy to use current events to lobby for a bigger budget. (E)ven if you believe the only thing holding up development of the Ebola vaccine was funds, it’s still false to argue that with more money we’d have an Ebola vaccine. Vaccine and drug development just simply doesn’t work this way. Look through titles of grants. Find grants that look obvious or silly. Do not contact researchers in charge of grants or read grants. Argue that agency wastes taxpayer money. 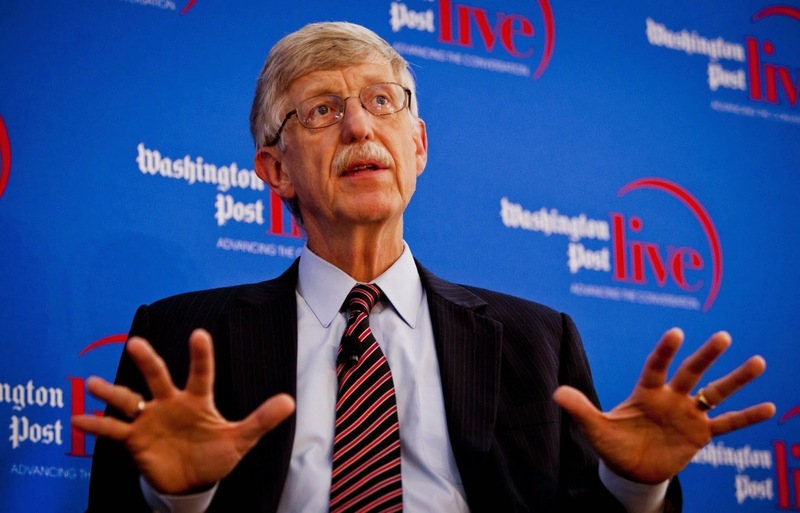 NIH Director throws basic research under the bus to score Ebola points. It backfires. Inside Higher Education has an article about the hiring process for University of Texas Rio Grande Valley. Twenty-five faculty from UTPA and UTB did not get offered their jobs back yet. The article goes into quite a bit of detail about the Phase I hiring process, and list all the reasonable concerns about the new university being used to remove tenured faculty for questionable reasons. What the article barely mentions is that there is a Phase II in the hiring process. I sat through quite a few discussions about this, and I got the impression that Phase I was more or less a rubber stamp. Not being selected in Phase I was certainly not the end of the process. It just indicated a little more vetting would be done. That doesn’t strike me as crazy or unreasonable, though it certainly could be implemented in an unreasonable way. The outcome of Phase II will be a much better indicator of the direction that UTRGV is heading than Phase I. Fellow crustacean neurobiologist Eve Marder has an opinion piece in eLife arguing against the notion that we should limit the number of doctoral students. Why might we have a discussion about limiting the number of doctoral students? Because the number keeps expanding. Here’s a relevant figure from about a year ago. Marder argues we should not try to reduce the number of doctoral students, because some of them will be great scientists, and we can’t pick who will be those awesome scientists in advance. 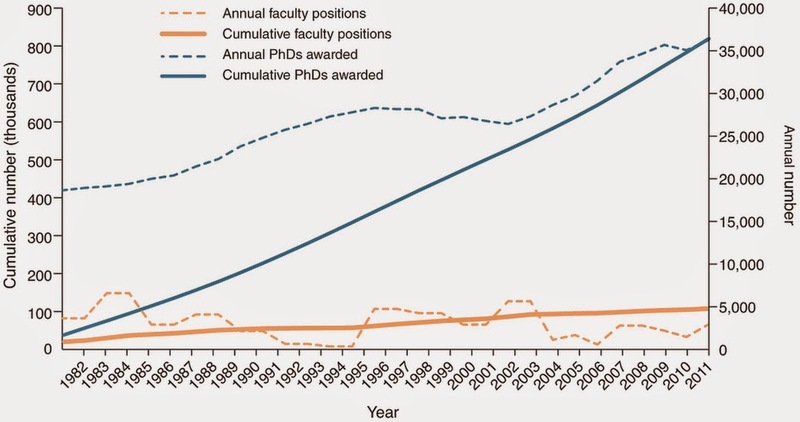 (I)f we significantly decrease the number of entries into PhD programs, we risk losing some of the most exciting, dedicated and creative young scientists(.) ... Admissions committees are bad at predicting who will end up deciding to stay in science. If admissions committees are bad at picking prospects, perhaps we should follow this logic through. An open door enrollment policy for graduate school probably wouldn’t work because faculty resources are limited. Maybe we could just admit students by a lottery system. It would save students all that arduous writing and transcript tracking needed to complete an application, and save faculty the time spent reviewing them. Big scientific discoveries are like business sales: there are steps that lead up to the sale, but every step suffers from attrition. Businesses try to widen the funnel through advertising and marketing. All other things being equal, more people entering the funnel means more sales at the end. “A wider funnel means more world-changing discoveries!” has some logic to it. But the analogy to the sales weakens substantially. 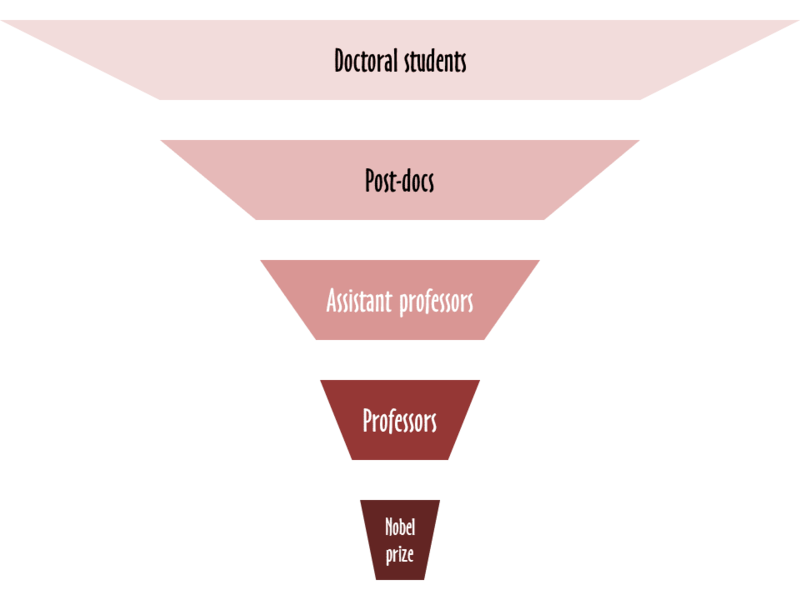 Advancing through every step in the academic funnel is long, and thus costly, to the people in the funnel. And whether you advance in the sale funnel is almost entirely dependent on you as a customer: sales people don’t try to block you from buying their product. Whether you advance in the academic funnel depends on other people (glamor magazine editors, hiring committees, promotion committees, deans, administrators), who may well try to block you from going into the next level of the funnel. Society would be enriched if more of the people making decisions in industry, law, medicine, education and politics had lived through the rigors of a PhD program, and knew first-hand how difficult it is to extract knowledge from our imperfect measurement and analytical tools. ... (G)raduate students will be better citizens of the world because of whatever time they spend confronting some of the deep mysteries of the universe. In biology, most people start doctoral programs because they want to be academics. I would far rather have a win-win situation where the type and amount of education and training people receive matches the career they eventually end up in. Underemployment – people in positions that do not require the higher degrees they have – is a lost opportunity as surely as keeping someone out of a doctoral program could be a missed opportunity. I might agree with Marder that it would be great to have more people in decision making positions with research experience. But does that have to be a seven year doctoral degree? What if the recipient of a two year master’s degree with thesis could accomplish 90% of that societal good done by the average doctoral recipient? If you think that number is too high, what if a master’s degree could even achieve 50% of that societal good? Of course, we could devise a much shorter curriculum to enhance those skills, and probably should. In any case, I suspect Marder need not worry about the number of doctoral students being restricted. There are far too many incentives now for faculty, administrators, funding agencies, and politicians to keep recruiting and producing more doctoral students. Hat tip to Bjorn Brembs. A Salon article about the importance of editors in literature surprised me when it took a turn in discussing scientific publishing. But surely the most endangered editorial role is, not coincidentally, also the most ineffable. In a recent post, Kent Anderson of the Scholarly Kitchen, a blog about academic publishing, reports that scientific and scholarly journals are now spoken of as if peer-reviewing were the only significant part of their editorial process: “one of the most important roles — that of the editor-in-chief or senior editor — seems to have been lost.” Of late, some journals have even been launched without any main editor at all; editorial and advisory boards, combined with peer review, have been deemed sufficient. There is no leader to be held personally accountable for the journal’s choices, and the publication loses something else, as well: vision, character, a personality all its own. Anderson argues that in scholarly publishing — although the same goes for journalism and book publishing — a good editor-in-chief provides much that is crucial if also intangible. Annoyingly, there is no link to the “recent post” mentioned in the paragraph above. I’m guessing it’s this one. In neither post is there a specific example of a journal “without a main editor.” I’d guess that that Anderson had in mind one of his favourite punching bags, PLOS ONE, as an example. Taking that as an example, let’s see what editors are supposed to be providing. Vision. Yes, an editor can articulate this, but editors are not the only ones who can. There has never been any doubt in my mind what the vision of PLOS ONE was: to provide a venue where science is judged on competence rather than perceived importance, and to publish open access. PLOS ONE has had advocates who have been as effective in articulating that vision as any editor. Character and personality: This can be provided by a clear mission statement about what a journal will consider publishing. Yes, someone needs to write that statement, but I don’t think it has to be a single editor in chief. Besides, I don’t care all that much about the “character” of a journal, because journals are not the major way I find relevant articles any more. First and foremost, the senior editor provides a strong signal to the market about who stands behind the journal, what level of scrutiny works will receive, and what disciplinary emphasis the journal is pursuing. Who stands behind the journal: I think Anderson is saying it’s important for there to be a person who says, “The buck stops here.” I have not seen many editors who are willing to take that position. The recent STAP cell problem was a great example. Nature’s editors claimed there was no way they could have identified the problems from the reviews they received. The reviews that they actually received paint a rather different story, with one commenter calling the reviews to Nature “blistering.” There is a real debate to be had about just how accountable editors should be in these situations. What level of scrutiny works will receive: I cannot figure this out from knowing how the editor is. The level of scrutiny is dependent on the reviewers, who vary. It’s dependent on how many reviews the article gets. It’s dependent on whether the review process is single blind, double blind, and so on. Disciplinary emphasis: See my comments on “Character and personality,” above. The personality, reputation, and work habits of the lead editor play major roles in setting the editorial tone. This can definitely be true, but it’s debatable whether than is always a good thing. There is also such a thing as institutional culture. We create institutions, like journals, to ensure that there is continuity that is not dependent on single indidviduals. To be clear, I actually do think good editors are very useful. But I am less convinced that a single individual need be the one performing those jobs. Hat tip to Rebecca Skloot. I wouldn’t think students would have to be traveling throughout the Valley with technology. I’m getting frustrated. Every time we hear questions asked about the UTRGV having multiple instructional sites, some almost a hundred mile apart, and how students will cope with that, multiple adminstrators, advisors, and politicians have all had the same answer. I think that what all these people are thinking is that we’ll have video conferencing capabilities and online courses. But let me tell you, as someone who live online: you have to be careful about this. I think in the time from when UTRGV was conceived to now, we’re already move through a hype and bust cycle with massive online courses (MOOCs). There is evidence accumulating that they work for a small subset of students, who are highly prepared and motivated and already pretty well educated. That is not the majority of our undergraduate student population. Online courses in the sciences face even more problems, because we have labs. And those labs are important. My big fear is that administrators and politicians genuinely don’t have a plan, won’t ask for input on a plan, foist the problem off on lower levels, and then complain when something that faculty said would not work does not, in fact, work. I would like to thank Sean Carroll. 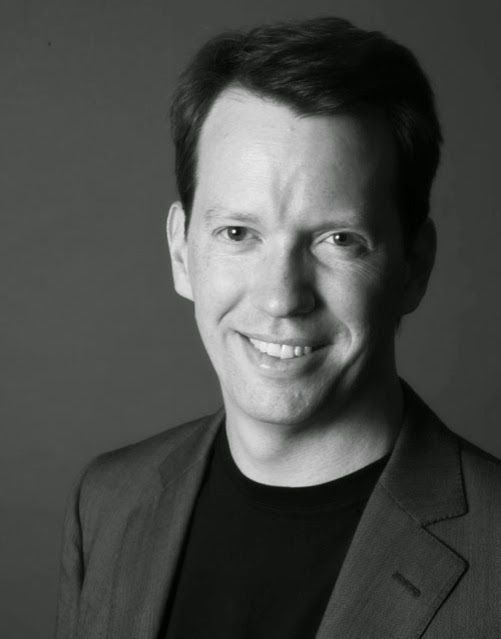 Sean made me appreciate something that I think is quite profound, and that should be much better known than it is: that we understand, at a fairly deep level, how the everyday world works. It’s a theme he’s returned to often in his blogging and writing, but here are a couple of key posts that lay it out. I cite these two blog posts a lot when I’m answering questions on Quora, because they squash so many questions and speculations about psi and paranormal phenomenon. There is no room for “mysterious unknown forces” that might explain phenomenon. For instance, for telekinesis to work, you’d need some sort of force that affects large objects (like a brain). But I do not need that hypothesis. We have forces that have been tested, repeatedly, and they explain everything we have ever been able to observe about everyday objects. I think that I never grasped that we understand everyday object so completely because physicists tend to stress the limits to what we know. We don’t know how gravity connects to quantum mechanics (long standing problem), we don’t know what dark energy or dark matter is (newer problems). It’s worth taking a moment to think about that achievement. I tend to think of modern empiricism starting around the time of Galileo, which is a little over 400 years ago. While Galileo didn’t start from zero, to go from as knowing as little as he did to a complete description what makes our world, as we know it, tick? That is an astonishing triumph for humanity. 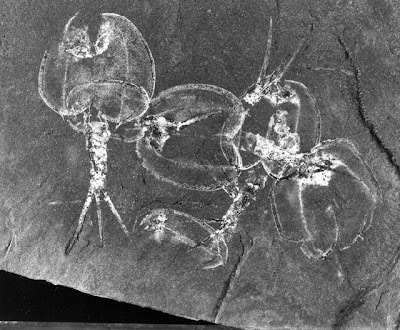 This gorgeous impressions were left by a species of Dithyrocaris, a phylocarrid crustacean. Photo by James St. John on Flickr; used under a Creative Commons license. (U)niversities have expanded the number of PhD students they train — there were about 30,000 biomedical graduate students in 1979 and 56,800 in 2009. That has had the effect of flooding the system with trainees and drawing out the training period. 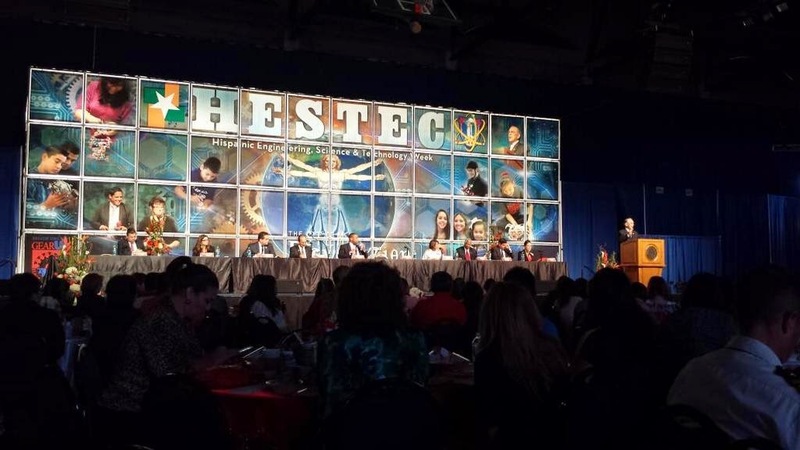 I doubt you’ll hear a single politician at HESTEC (and there’s quiet a few here) mention this issue. I am a big fan of “Nerdy” Christie Wilcox, Bethany “Scicurious” Brookshire, and Jason “Needs a catchy nickname” Goldman. 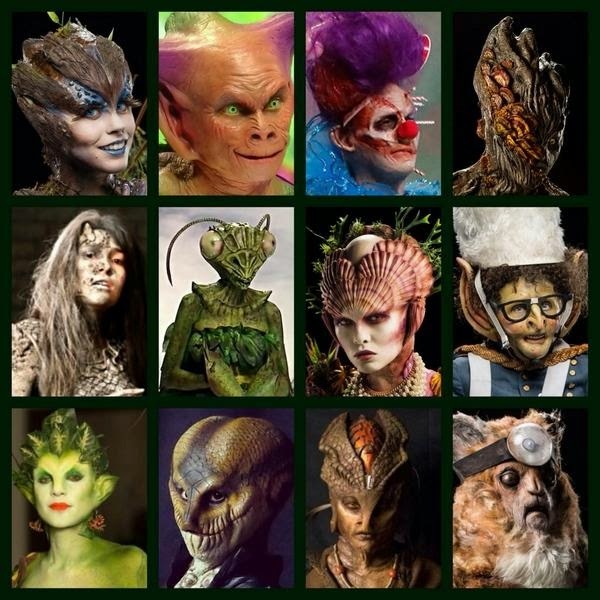 They have all appeared on this blog in one form or another, and I on theirs. These three fantastic writers have edited The Complete Guide to Science Blogging, which will be out next year from Yale University Press. I am not just a fan of this book, I am also a contributor. I do not, however, know much more about the book yet. I am looking forward to seeing who the other authors are, and what their chapters are about! These are slowly being revealed on the book’s Facebook page. Next year seems to be a year for book chapters for me... although I think I am done with book chapters after the ones I’ve finished come out. “Hi, I’m [name], working in [lab] at [institution]. Then, describe your research in a way that sounds almost exactly like you memorized it from a journal abstract, starting with a bland generalization (“Beetles are a speciose group,” “Sauropod dinosaurs were the largest land animals,” “Climate change will create conservation challenges”) before drilling down to your specific question after about 1-3 minutes. Once you start listening, it is surprising how consistent this pattern is. What ever happened to Open Lab? 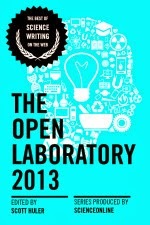 I have been thinking about the Open Lab anthology the last couple of days. The annual anthology used to be something that generated excitement in the science blogosphere. People advertised for nominations, hundreds of entries were submitted, and there was a lot of noise when the finalists were selected. And I haven’t heard anything about whether there is going to be one for this year. When you look at the Open Lab page at the Science Online website, the last mention is the release of the 2013 edition. Nothing about 2014. Maybe this reflects the emergence of new social media. A lot of science conversation that once might have happened on blogs moved to Twitter and elsewhere. Maybe it reflects the death of Google Reader and other RSS readers. I know my blog reading habits have never recovered since Google Reader shuttered. Maybe it reflects increasingly professionalized, with an upswing in blog networks by established media brands. There’s no longer the sense that blogs have a credibility problem that needs a showcase to show it’s not just people writing in their pajamas mouthing off, or that blogs are ephemera where the good stuff needs to be archived. Maybe science blogs have just become too routine. 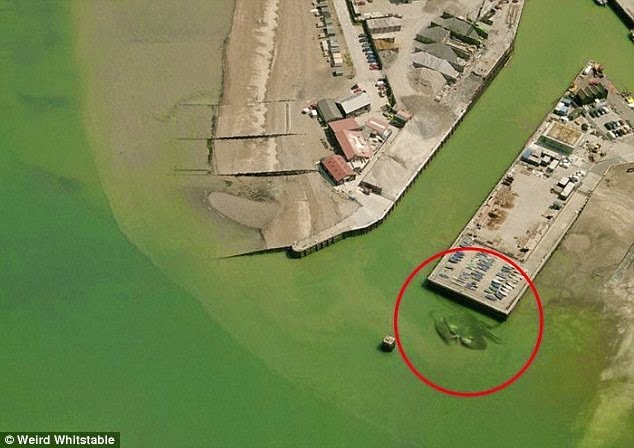 Update, 10 October 2014: Well, now we have an answer, of sorts. A sad one. The Science Online organization is done, no more, and the planned 2015 Science Online conference is cancelled. Knight Science Journalism Tracker has a summary here. 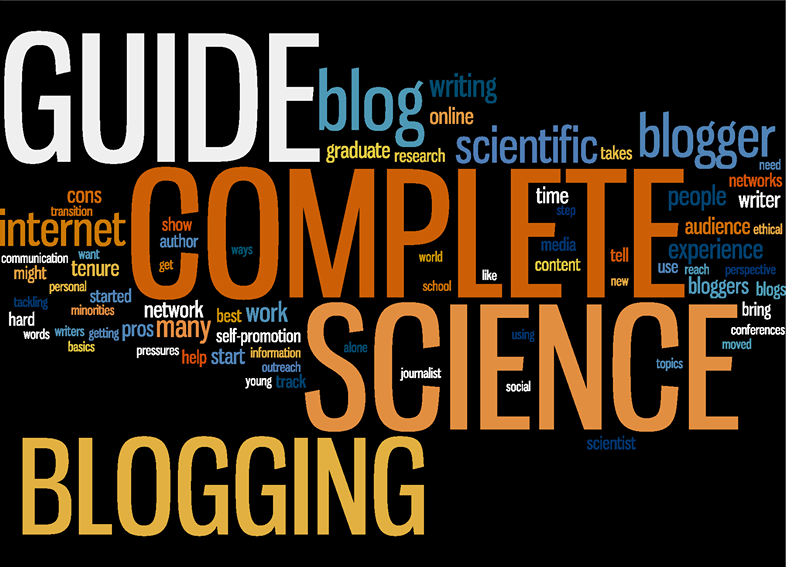 ScienceOnline... never really evolved beyond the time when blogs were new. Blogs were quick and nimble mainly because they were small, with few layers of editorial decision-making. This gave them an unmatched power to respond to events, but has limited their reach. The leaders of online science have gone beyond the blog, exploring many other avenues of creativity. I was chatting over the weekend about the still undecided mascot for The University of Texas Rio Grande Valley. I’d heard that Edinburg city council had passed a resolution in support of keeping the current mascot, the bronc. Ultimately, this will come down to power and politics, as much as anything, which is presumably why the anti-Bucky crowd is concerned: UTPA is the larger and more powerful of the schools, and Edinburg is by a substantial margin the wealthier of the two communities, compared to Brownsville (Edinburg's median household income is more then 30% higher than Brownsville's). It is surprising to me the amount of political heat that mascot names generate, but the UTRGV mascot situation is far from unique. At the national level, we have the Washington Redskins being pressured to change their name. And a few years ago, the change of another university mascot, from a plantation owner to bear, got national attention. 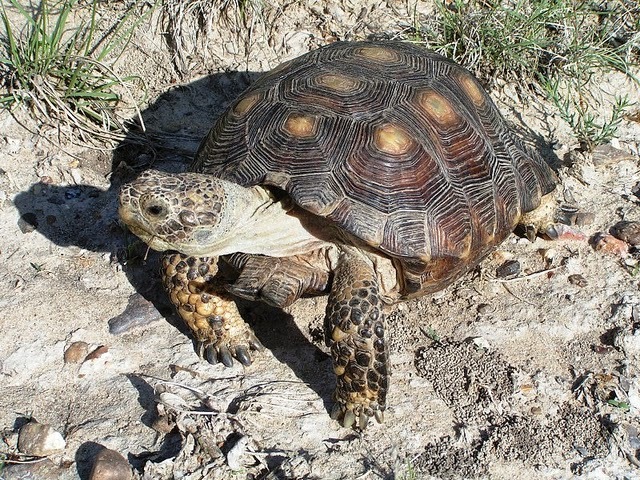 If the University of California Santa Cruz can have a banana slug as a popular mascot, why not a tortoise? (T)he resolution highlights how sensitive everyone can be when it comes to debating pagan-like animal worship. Update, 28 October 2014: The Texas Monthly considers the biggest sporting debate in Texas right now to be, “Are you for or against Bucky?” The article raises the specter of this being a bellwether for constant infighting over the direction of UTRGV. Tortoise pic by Sara Viernum on Flickr; used under a Creative Commons license. Science of the South examines which area has historic campus buildings statisically.